One of the most puzzling lapses in accounts of the rise of the West following the decline of the Roman Empire is the casual way historians have dealt with Gutenberg's invention of printing. The cultural achievements that followed the fifteenth century, when the West moved from relative backwardness to remarkable, robust cultural achievement, would have been impossible without Gutenberg's gift and its subsequent widespread adoption across most of the world. 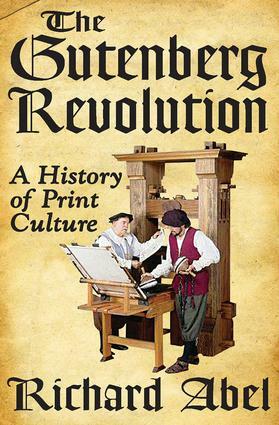 Richard Abel follows the radical cultural impact of the printing revolution from the eighth century to the Renaissance, addressing the viability of the new Christian/Classical culture. Although this culture proved too fragile to endure, those who salvaged it managed to preserve elements of the Classical substance together with the Bible and all the writings of the Church Fathers. The cultural upsurge of the Renaissance (fourteenth to seventeenth centuries), which resulted in part from Gutenberg's invention, is a major focus of this book. Abel aims to delineate how the cultural revolution was shaped by the invention of printing. He evaluates its impact on the rapid reorientation and acceleration of the cultural evolution in the West. This book provides insight into the history of the printed word, the roots of modern-day mass book production, and the promise of the electronic revolution. It is an essential work in the history of ideas.